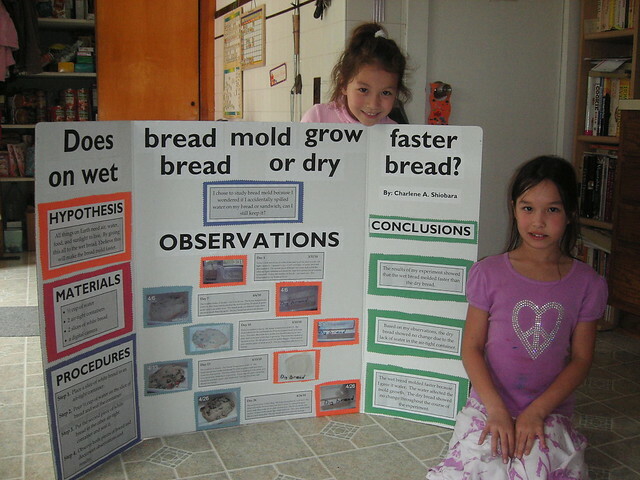 Mold Bread Experiment - What Makes Mold Grow? We are going to perform a mold bread experiment to grow our own mold and find out whether mold does indeed grow faster at higher temperatures. In ten days you will be able to answer this important question and make a contribution to science! But what is mold? What makes it grow? Mold is something that we often take for granted, as something that makes us have to throw the bread away or the cheese smell bad. Mold is, in fact, a fascinating organism which has had many different uses over the years and our lives would not be the same without it. Most of us know that food seems to become moldy more quickly in the summer than in the winter when it is colder. Food in refrigerators seems to keep longer than food left out in the sun. Is this true? Does temperature really affect the rate at which mold grows? Please note that some people are allergic to mold; ask your doctor or parents. If this is the case, do not pick the Mold Bread Experiment. Always wear gloves and a mask, wash your hands, and don’t eat or drink whilst you are performing this study. 15 slices of bread. Any sort will do but it is perfectly fine to use cheap white sliced bread as then you will know that all of the slices are a similar size, weight and thickness. You must make a note of the brand and use-by date so that anybody else wanting to repeat the Mold Bread Experiment can use the same type. Mold Spores - if you can’t get these from your school don’t worry. There are mold spores all around us in the air which will eventually grow on the bread but your experiment will take longer. Using the sticky labels and the marker pen label the bags. Mark 5 bags as ‘A’, 5 as ‘B’ and 5 as ‘C’. You also need to label each set of bags 1 to 5. Cut the bread into 10 x 10 squares using the chopping board and knife. Inoculate the bread thoroughly with the mold solution. Try to coat each slice with a similar amount of the culture although this can be difficult. Put one slice of this bread into each bag and seal the bags tightly. Put the 5 ‘A’ bags into the freezer, the 5 ‘B’ bags into the refrigerator and the 5 ‘C’ bags somewhere safe in a warm room. Because the bags in the freezer and fridge will not be getting much light it is best to cover the ‘C’ bags to make sure that light is a constant. Every 24 hours, preferably at exactly the same time every day, using the plastic grid, count the number of square centimeters of mold on each slice of bread. If the mold covers more than half a square, count it as 1cm, if less than half a square, count as 0 cm. You must never open the bags. You should repeat these counting processes for 10 days or until there are significant measurable results. 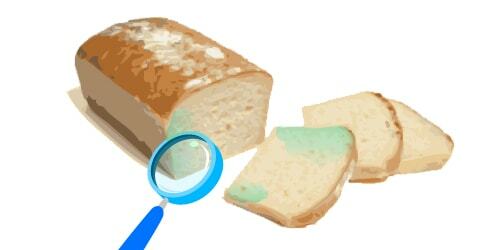 Keep a careful note of your results for each slice of bread for the entire duration of the experiment. 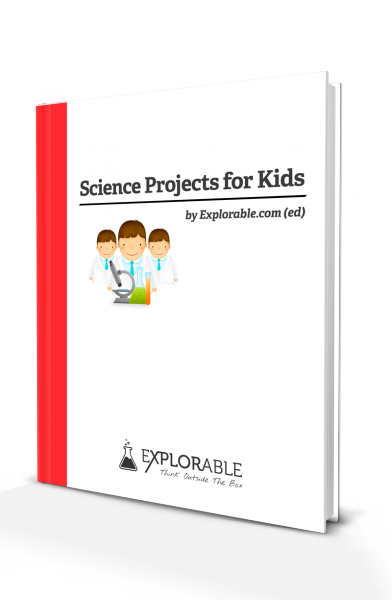 You can even take pictures or draw the slices if you want to be really scientific! Average the results for sample types A, B and C.
Once you have finished, throw out all of the bags without opening them. Because each square of bread is 100 cm2, you can express your results as a percentage. For each of the bread types, A, B or C average the amount of mold grown over the ten days and write these figures into a table. You can then plot this information onto a graph and begin to explore your results. 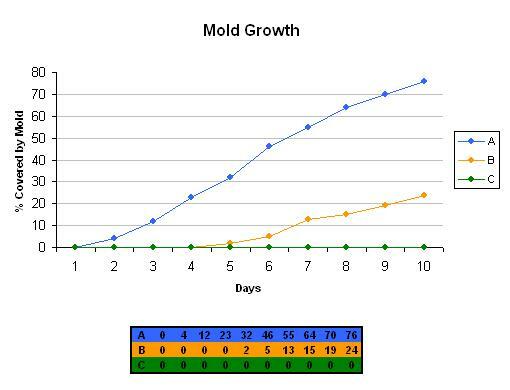 You can plot the amount of mold on each bread sample and compare it to the number of days, like in the diagram below. This can be done with a sheet of graph paper and colored pens or on a computer. Could you replicate the graph below or is your graph different? We have done this, but will not give you our answer, so you can test for yourself! The food industry spends millions of dollars every year on refrigeration and it is very important that they know what temperature they need to stop mold from growing. Moldy food must be thrown away and this costs restaurants and manufacturers a lot of money. For companies using mold to make food or medicine they need to know at which temperature mold grows best. The faster the mold grows, the quicker they can sell their product and make money. Now that you have finished and obtained some results, maybe you want to see if other variables affect the rate at which mold grows. Maybe you could keep the temperature the same for all of the samples but use different types of bread. You could try adding moisture to the slices or putting different amounts of sugar or lemon juice onto the slices. As long as you only vary one thing at a time, you can make some interesting studies about mold. Temperature is not the only thing that affects the rate of mold growth so feel free to try and find out more about this interesting organism. Mold is not a plant but a fungus like mushrooms and toadstools. It grows on food and other organic matter, breaking it down into slime and extracting nutrients for growth. Alexander Fleming discovered that a common type of mold fungi kills germs. From this, he made a medicine called penicillin which has saved millions of lives over the last 80 years. Many other life-saving drugs are made from chemicals obtained from mold. Mold is one of nature’s cleaners. It breaks down dead organic material and recycles the nutrients back into the soil. It is essential in nearly every ecosystem in the world. We use molds for flavor in some foods such as blue cheese, soy sauce and Quorn(TM).